Classical music audiences enjoy focusing attention on the music during performances, and performers prefer quiet in the audience while they are playing. There are a number of sounds that can be distracting, including unwrapping candies, whispering, leaving or taking your seats unexpectedly, flipping pages in the program, beeping wristwatches, ringing cell phones, etc.You might find it interesting to listen to the sounds around you during the concert. When is the audience quiet? When do people cough? What’s happening on-stage when the audience is making noise? What happens when an unexpected noise occurs? You might also enjoy listening for unexpected noises coming from the orchestra. Classical concertgoers tend to dress formally, reflecting the more traditional atmosphere of the concert hall. You might try observing those around you and noticing how they dress. Or you can watch as concertgoers enter the theater and take note. How do the older people dress? What about the middle-aged people? Do you see any young children? – if so, how are they dressed? Knowing when to clap can sometimes be tricky. Sometimes you might think a piece of music is finished and be ready to clap, and then notice that no one else is applauding. Some pieces of classical music are made up of more than one section. Each section is called a “movement.” Symphonies and concertos generally have more than one movement. The audience tends to clap only at the end of the last movement. Sometimes if the music is especially stirring, applause will break out when a movement finishes, even if the whole piece is not finished. You can usually figure out how many movements a piece has by reading your concert program. If you’re unsure when to clap, try watching those around you to see when the applause begins. And notice if there is any clapping at an unexpected time: When does it happen? There’s no need to rush to leave the performance when it’s over. This is a time for the audience to thank the conductor and the musicians for their hard work on the stage. There could also be an encore (an extra piece that’s not mentioned in the printed program). Sometimes the conductor or soloist is called back once, twice or more to receive applause or to play additional encores. This is a good time to pay close attention to what’s happening in the audience and on the stage. How long does the audience applaud before the conductor comes back out? How many times does she or he come out before playing an encore? You can watch and see if there are any encores and listen for the final applause to die down before exiting the theater. … And when you’re on your way out, it might be interesting to listen for other people’s comments about the performance. Do they seem to have enjoyed the performance? What is their feedback? Are people talking mostly about one particular piece or player? Sometimes these comments can help you reflect on and connect with own reaction to the music. Enjoy your concert going! Orchestras as we know them today were first established in the 18th century and numbered 30 to 40 players. During the 19th century, instrument-making techniques improved and orchestra sizes increased. Today an average orchestra may contain 40 to 70 players; some have as many as 110. Each of the four sections in an orchestra has a different role. 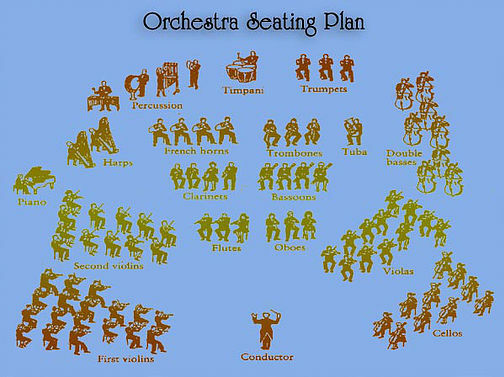 Not all orchestras are seated exactly as in the picture above. You might want to notice how the orchestra is seated for each concert you attend. Are there any violins on the right side of the conductor? How are the winds seated? Are there any seating changes or changes in the number of players from piece to piece? Are any of the orchestra players seated on risers? The STRINGS, almost always the largest section of the orchestra, often provide the musical melody. See if you can pick out the different string sounds from lowest to highest as you listen. How many string basses are there? How many cellos? Can you tell the difference between the violas and violins? What about the second violins and first violins? Each of the string sections usually has a section leader who closely watches the conductor and helps cue the entrances for his or her entire section. The section leader for the first violins is usually the concertmaster. The CONCERTMASTER sits to the conductor’s left and helps give cues to the strings and to the rest of the orchestra. The WOODWINDS sometimes carry the tune, or give color and warmth to the overall sound. Not all pieces of orchestra music call for woodwinds. Some call for just two woodwinds of each type (flutes, oboes, clarinets, bassoons); others call for three or more of each. Sometimes you will see and hear special instruments in the woodwind section in addition to the standard woodwinds. One of the flute players might “double” on piccolo (a small, high flute); one of the oboe players might switch to English horn (a low oboe); one of the clarinet players might pick up an E-flat clarinet (a small, high clarinet) or bass clarinet (a large, low clarinet); and sometimes one of the bassoon players might be asked to play a contrabassoon (a very large and low bassoon)… And sometimes you might even see saxophones on stage. See if you notice any unusual instruments or sounds in the woodwind section for each piece. The BRASS instruments may add brightness and emphasis in dramatic passages, or may lend their particular colors to the melody. Some pieces of music call for no brass players at all, while others call for large brass sections. How many brass players do you notice on stage for each piece? Which instruments are they playing? The PERCUSSION section provides the orchestra’s rhythmic backbone. Some pieces of music have no percussion instruments, others have just the timpani (kettle drums), while others have colossal percussion sections with many instruments and players. What do you notice about the percussion section for each piece you hear? If you can’t see the players in back from your seat, you might try listening for the individual percussion sounds. Some pieces of music call for added instruments like a piano and one or two harps. When there is a piano soloist, the piano is placed near the conductor instead of at the back. Do you notice a piano or harp(s) when you look around the orchestra or listen from your seat? The CONDUCTOR sets the tempo, volume and balance of the piece during rehearsals and performance. You may want to watch the conductor closely during the performance. How does he or she indicate a loud section of music? What about soft music? What is the conductor’s style like? Does she or he move around a lot or stay in one place? Does he or she use a baton? What hand does the conductor hold the baton in? What about music: does the conductor read from a score with a podium or conduct with no music? For more information, we recommend the BBC Guide to the Orchestra for young people.